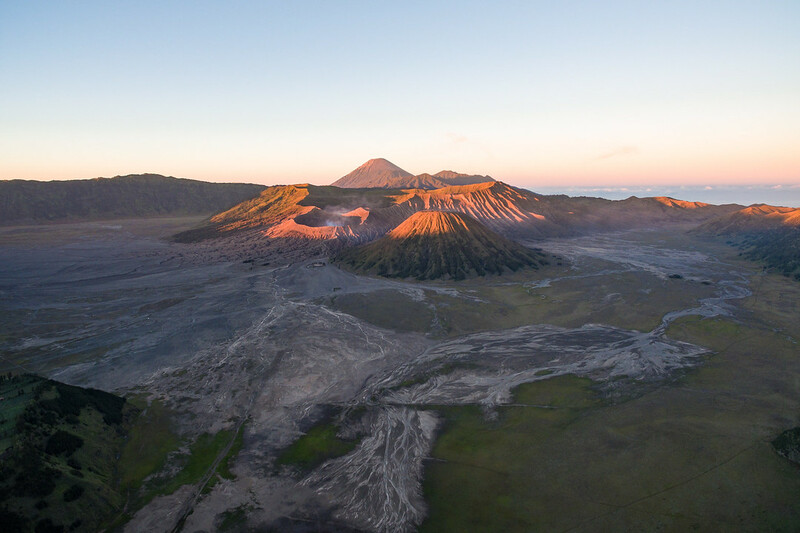 Watching the sunrise on Mount Bromo was on top of our list since our series, Expedition 100, was at its preparing stage. Only a few pictures were enough to be sure it had to be on our Top 100 list. And you know sometimes it’s the places you expect the most of that disappoint you the most. This time it was just as breathtaking and mesmerizing as we could have ever imagined it would be. You may have already watch Season 1 Episode 3 about our trip to Java, from temples to volcanoes, if not you will find it at the bottom of this article. 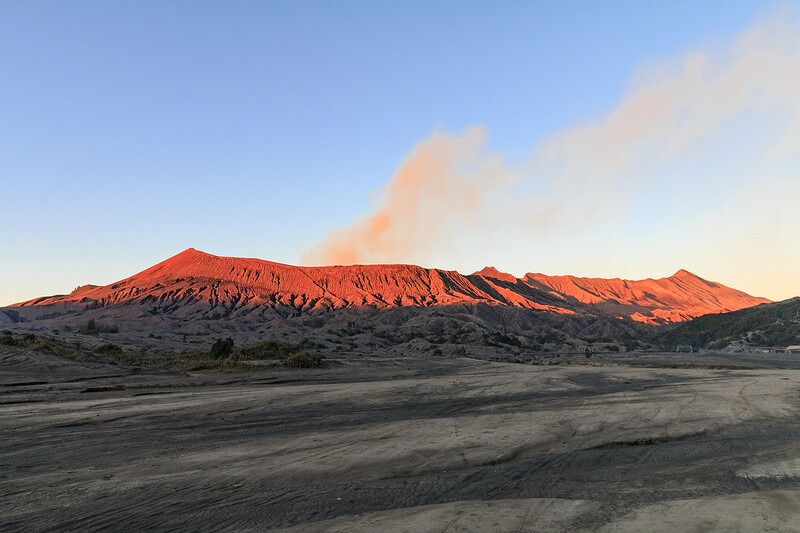 I wrote this informative article to share with you how we did Mount Bromo sunrise on our own, without any guide or travel agency. 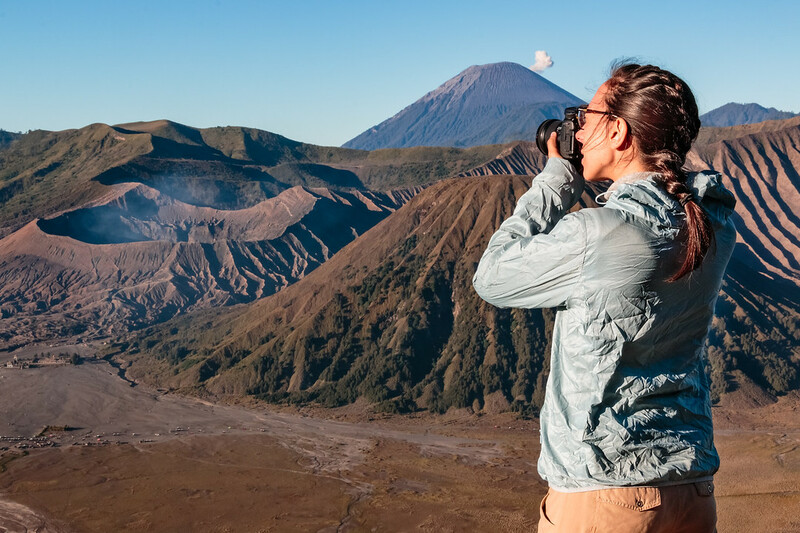 I gathered all my best tips on how to watch the sunrise on Mount Bromo, how to get to Mount Bromo and our hotels recommendations. 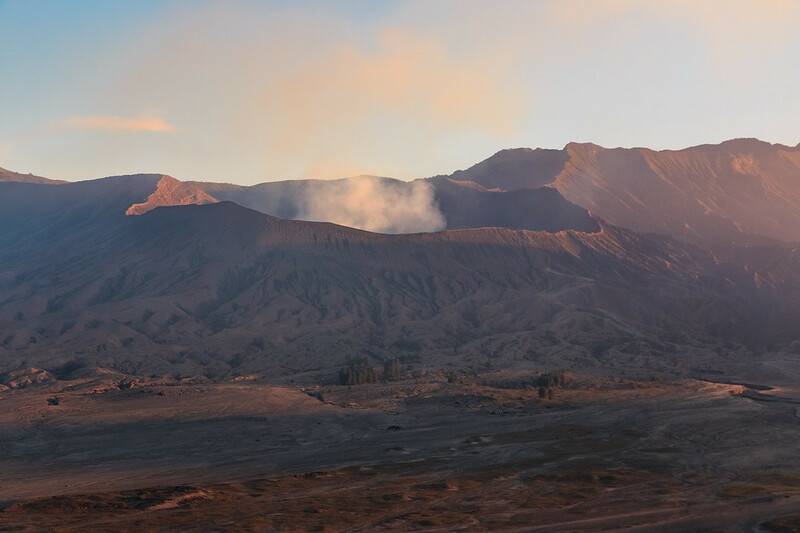 Mount Bromo can be reached by plane. You can fly to the nearest airport, Juanda international airport in Surabaya. There are direct flights to Surabaya from Singapore, Kuala Lumpur, Hongkong, Jakarta and Bali. From there you will have to take a train or a bus to the city of Probolinggo. Train travel on Java is cheap and straightforward. You will have no issues booking your own tickets, either online or in train stations directly. Buses are usually slightly cheaper but most of the time they are not large buses but minivans, and those are way less comfortable. The best option while still cheap is train travel. We personally booked our train tickets from Yogyakarta to Probolinggo through tiket.com for 470.000 rupiah for 2 Business Class tickets plus around 15,000 rupiah of processing fees. Economy is obviously cheaper as you don’t have aircon, only fans. 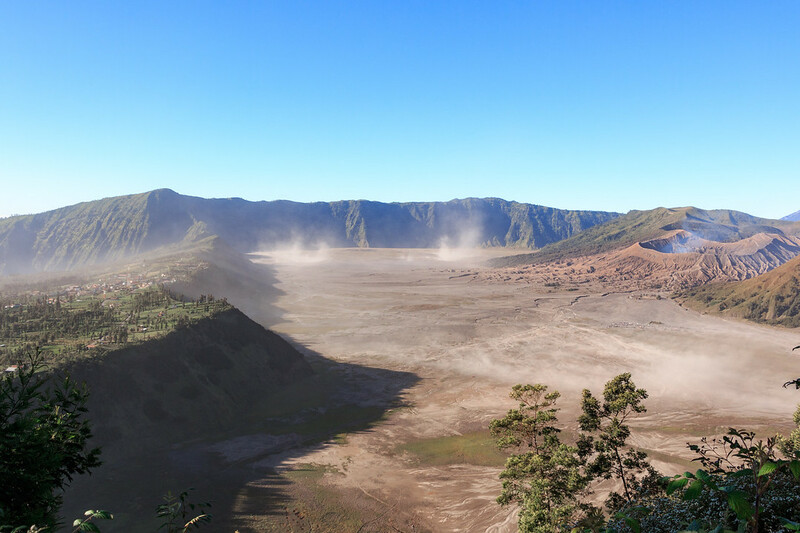 The closest village to Mount Bromo is Cemorolawang, and to get there, you need to take a bus from Probolinggo. The route takes about 1 hour 30 minutes. 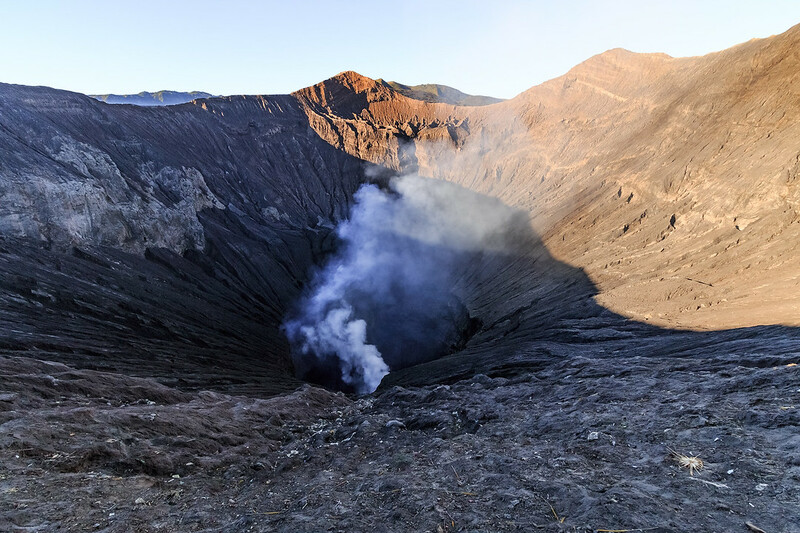 If you are planning on arriving in Probolinggo and going straight to Mount Bromo the same day, make sure to arrive early enough so you can get on a minivan to Cemorolawang. There might not be buses or be enough people to share the costs if you arrive late. Alternatively, you can spend the night in Probolinggo and leave the next morning. 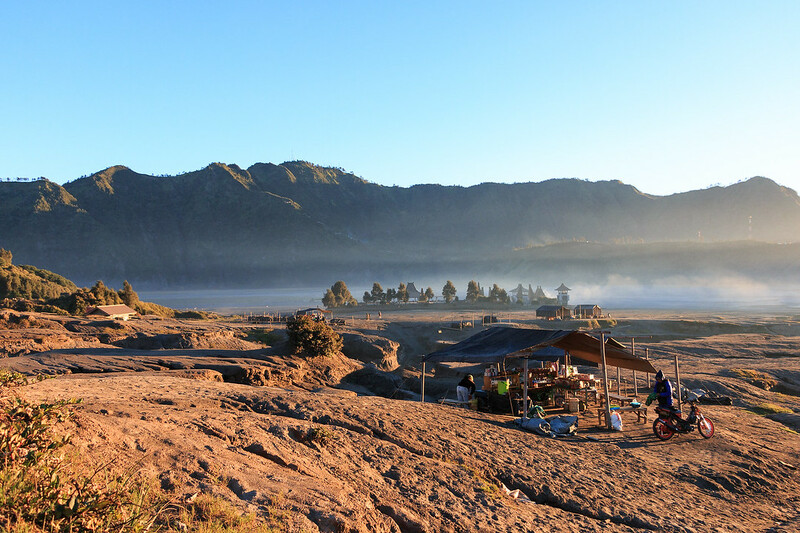 Here is the exact location of the Bromo minibus station in Probolinggo. Price : 35,000 – 45,000 rupiah / person, depending on your negotiation skills and number of people travelling in the minivan. There are no real timetable, the buses leave whenever they are full or with enough people. We had no problem finding a bus and enough people (around 10) to travel with in June. 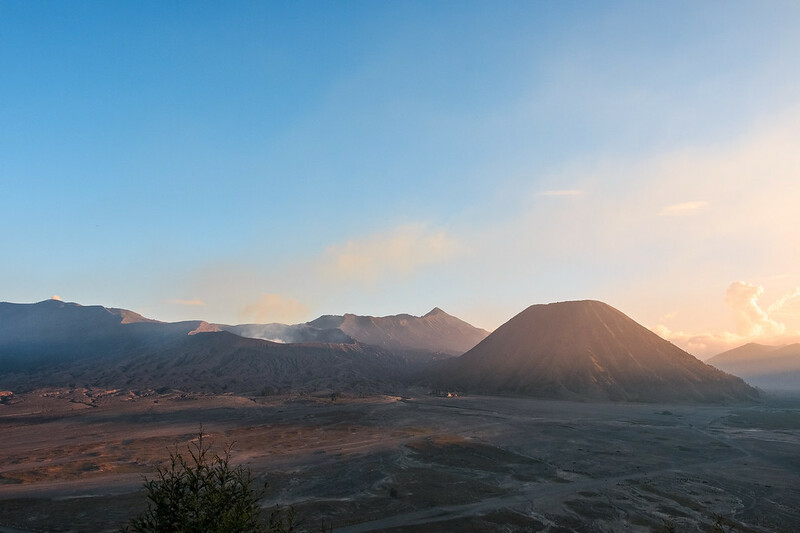 I don’t see any other reason to spend the night in Probolinggo than visiting Mount Bromo. The city is not worth visiting in my opinion. But if you do look for hotels in Probolinggo, and if you want to stay close to the train station to take a train to Yogyakarta or Banyuwangi the next day, then we recommend Clover Homestay and Cafe. We stayed there before heading to Ijen and had a pleasant stay. The room was clean, shower was nice, and service is friendly. Breakfast is more like a snack than a proper breakfast though, that’s the only downside. You can book a room here. If you stay overnight in Probolinggo before taking a minivan to Bromo then it’s better to stay close to the bus station. There are a few hotels but the only hotel with the best value for money is Lava Hostel and Resto. Don’t expect 5 stars service and good food though. Bear in mind that it’s only for 1 night. Make sure you book the right one though, as they have other hostels and hotels with similar names : Cafe Lava Hostel (budget) and Lava View Lodge (mid-range) are both in Cemorolawang, not in Probolinggo. We didn’t book in advance, there are many budget hotels and guesthouse to choose from. When you arrive in the village, just walk around and bargain the price. 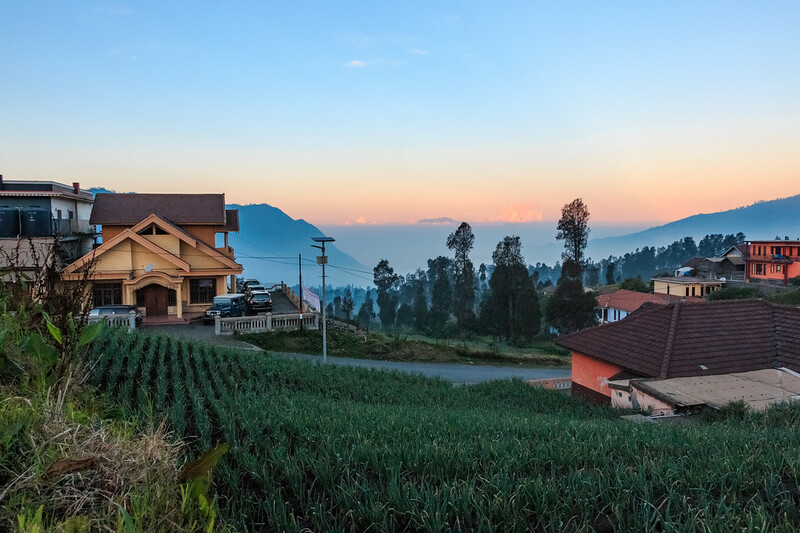 In Cemoro Lawang you can find hotels with double rooms from 150,000 rupiah per night with a bucket bathroom and basic bedding. Most of the rooms we saw for that price were not very nice, moldy and dusty. 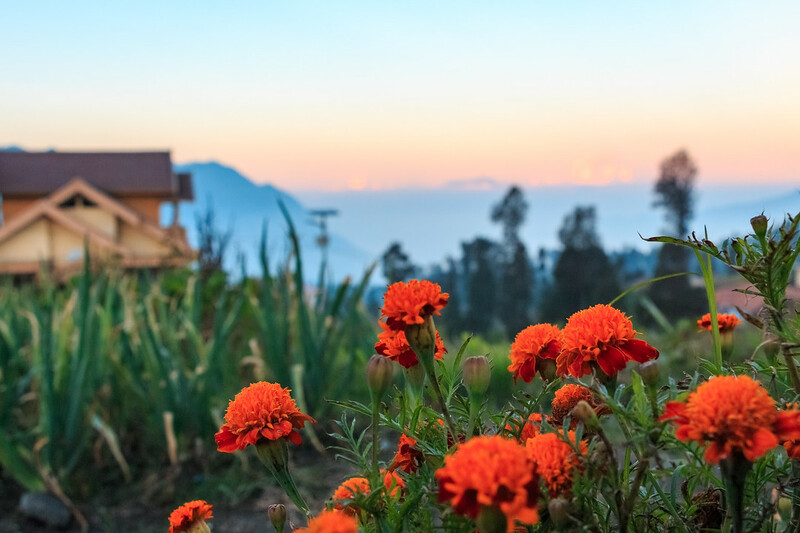 We stayed at Tengger Indah for 250,000 rupiah, too expensive for what it was but the rooms there are much cleaner than all the other places and the view from their balcony is priceless. We can also recommend Homestay Udin, which is slightly cheaper than Tengger Indah for the same kind of room. If you want a more comfortable hotel with a proper shower, we recommend Bromo View Hotel or Hotel Bromo Permai, which has a pretty decent buffet breakfast. 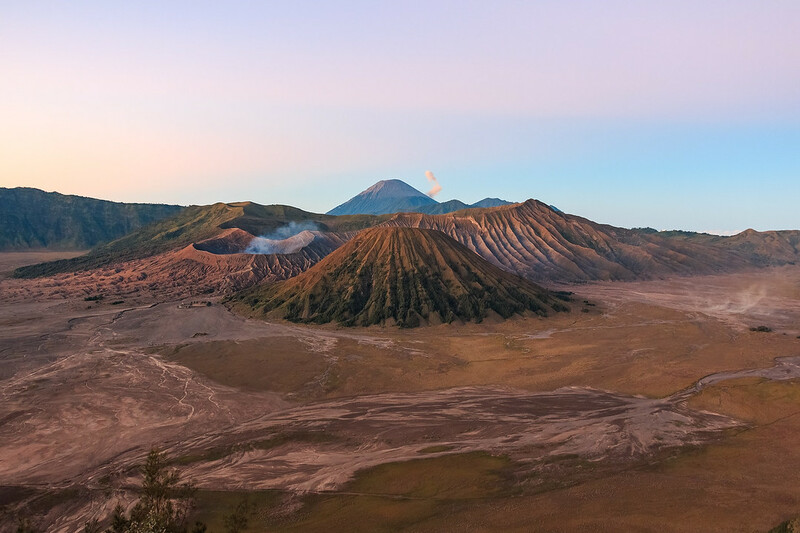 What to pack for Mount Bromo ? Make sure you have a fleece jacket, a rain coat, hiking trousers or sports clothes, a wholly hat and a pair of gloves. You can buy those in the village for less than a dollar. It gets cold up there and you will be hiking at 4am. 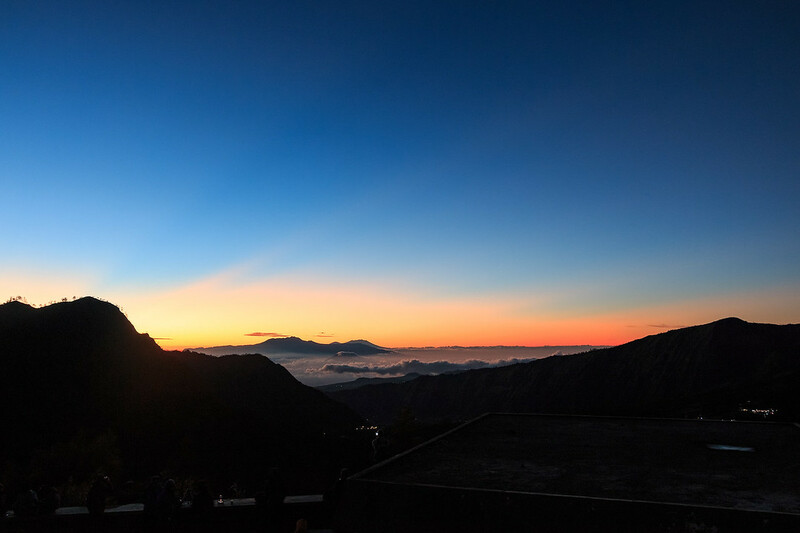 Depending on where you stay in Cemoro Lawang, it will take you between 1.5 and 2 hours to climb to the view point on King Kong Hill. To get there simply walk up the main street and keep right when you see a (intersection). From there, there is only one way up and there is no way you can get lost. Depending on the season (we were there in June) the sunrise time will vary, make sure you check it before leaving. The main viewpoint is a few meters and minutes more from the first platform. The view is supposedly better there but I couldn’t tell as we didn’t climb all the way to the top like everyone else. Instead we stopped at the platform with the sort of terraces made out of concrete. You can climb on top of the one on the right and get a pretty good view from there with no one in front of you. The sun rises on your left side, over the mountains. 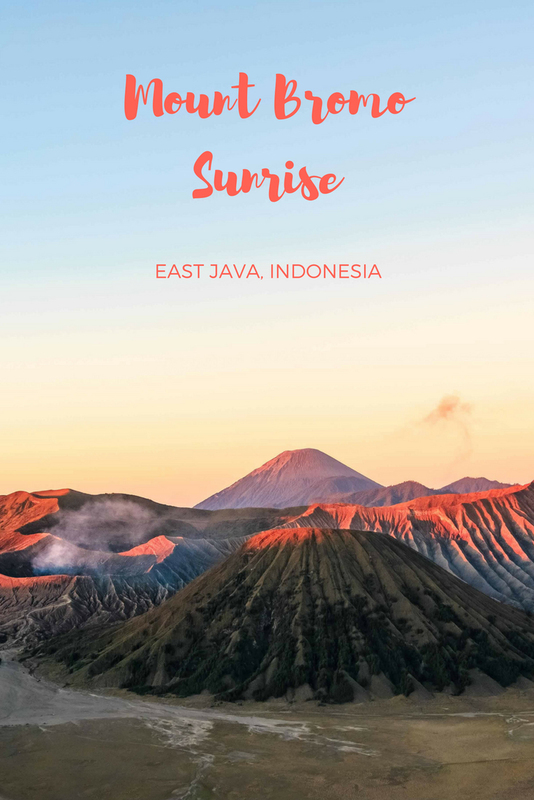 While it is a nice view, the best view is the volcanoes slowly emerging in the landscape, illuminated by the red rays of sunrise. This was the best part of the whole experience. Around 6.30am everybody had left and the golden hour was gone, leaving a green and brown scenery. 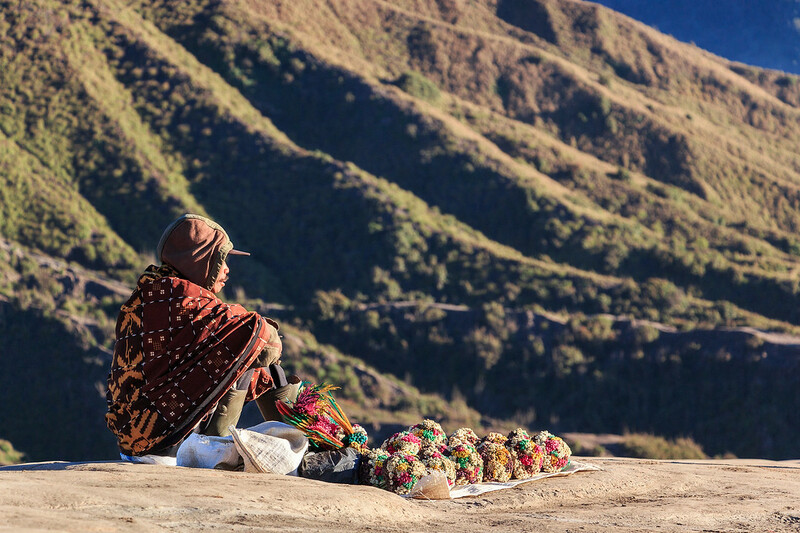 There are always locals selling tea and snacks for a very decent price so if you don’t want to carry something to eat don’t worry you’ll have plenty of choice over there. Now, you either go down King King Hill to go back to the village and walk to the volcano through the sea of sand, or go back to your hotel and take a nap. We chose the latter, and decided to do the sea of sand the next day. 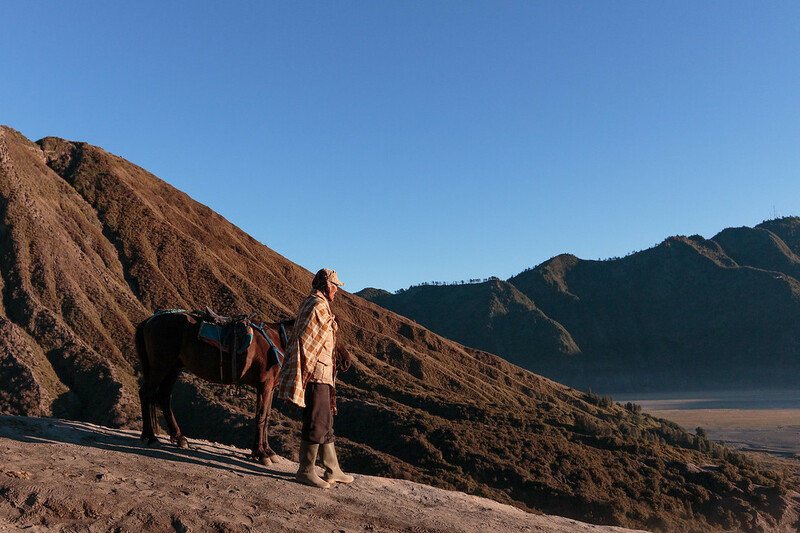 When researching how to watch the sunrise on Mount Bromo I read a few articles and blog post saying they asked for money at the entrance of the village (around 10,000 apparently) and then an entrance ticket to get down in the sea of sand, as you enter Mount Bromo national park. In the weekends it’s 325,000 IDR per person, and 270,000 during the week. We have never been asked for anything while we were there. 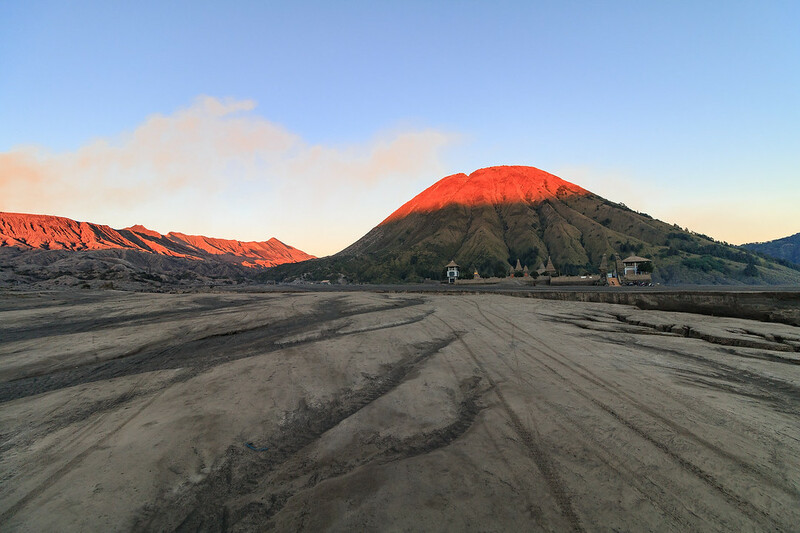 Since we visited Bromo in 2 days, we got up the next day early enough to climb to the top of Mount Bromo in time for the sunrise. We went down the caldeira through the « villagers trail » which is a simple dirt track going down next to Cemara Indah hotel. I don’t know if it’s because it was 5am but nobody was there to check if we had paid for entrance tickets or not. 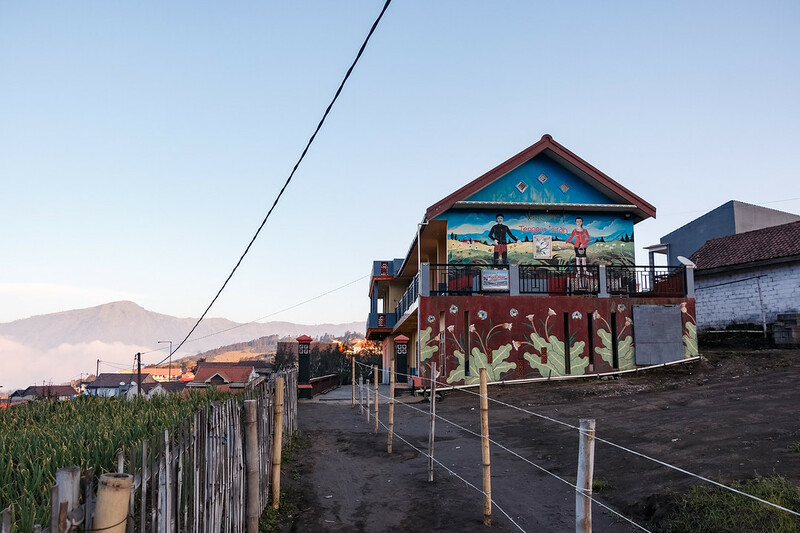 Walking through the caldeira, we saw a few jeep and bikes transporting people to the bottom of the volcano. We followed the path as show on Maps.me and got to the bottom an hour later. The jeep and bikes have to stop quite a long way before the stairs that get you to the top of Mount Bromo, as the terrain gets hilly. From there you will be offered a horse ride to the bottom of the stairs. If you are in good shape and willing to save a few bucks we highly recommend to walk all the way or at least to skip the horse ride. I saw some horsemen mistreating their horses to the point where I had tears in my eyes. I don’t even want to think about how long those horses actually live. Don’t think I am over sensitive. I stayed quite a while near the horses while waiting for Antoine to get down the volcano and not once did the horses get any water or food while waiting in the burning sun. Research the topic and you’ll find that I am not the only one talking about this. Anyhow, while you are at the bottom of the stairs you can only go up ! We got there around 6 am and a few people had climbed to the top already. The sun was up and the summit was red from the sunrise. We arrived to the top with difficulty to breathe as the climb up the stairs after walking for a little bit more than 1 hour was already intense. The sound coming from the crater is the thing I remember the most clearly. It was like standing next to a plane reactor. 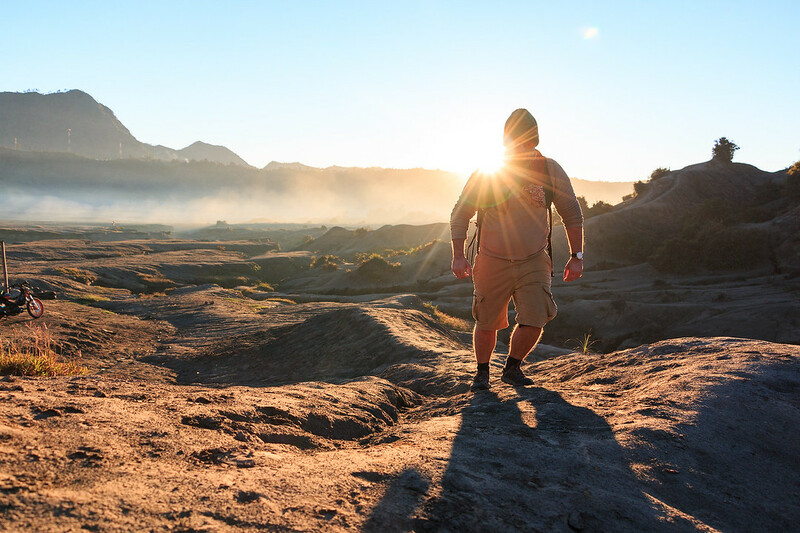 It is an incredible experience to stand on top of Mount Bromo with the golden rays of sun illuminating this beautiful landscape while feeling the power of a volcano under your feet. I have to admit though I didn’t stay long. The path alongside the top of the crater is rather narrow and slippery at times. And if you have been following our journey so far you may know I am terribly afraid of heights. I had a crater on my right side and a slippery slope of a few hundred meters high on my left side. Plus it was almost 7am and the crowd that was on top of King Kong hill for the sunrise was arriving to see the crater. It can get quite crowded over there. But Antoine stayed a while longer to get some pretty cool 360° video shots as you may have already seen in the video (link at the bottom). On our way back to the village we stopped at the temple but couldn’t enter the most sacred part. Do stop by if you have time, but if you don’t, there is honestly nothing amazing to see in this temple in my opinion. Unless you are allowed to enter to pray. We took the minivan back to Probolinggo the same day, having no trouble finding a big enough group of people to get a decent price. Unique experience and highlight of our tour. Got up early (around 3 am) then transferred by jeep, followed by 45-minute hiking to the volcano crater. This is a place which looks something out of the world. Amazing ..